A Putuo chemical park is being converted into an intelligence and innovation town. And it will have a green area inspired by London's Hyde Park and New York's Central Park. A bird's eye view of the city’s once largest seafood market, Tongchuan Road Aquatic Product Market, which was shut down last November. 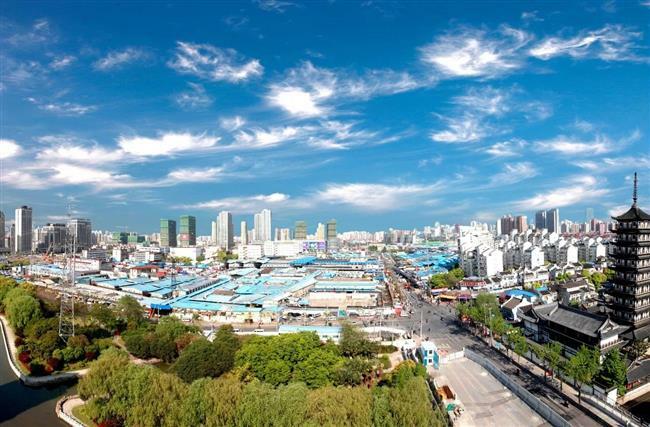 Shanghai’s former chemical industrial park in Putuo District will become an “intelligence and innovation zone” by 2022 with large greenery coverage. Taopu chemical park has since the 1950s housed industrial giants such as the Hero Pen Factory, Shanghai Rubber Factory, and Shanghai No. 1 TCM factory. But now a bright, new future awaits. Most plants, including Shanghai Printing Ink Factory and Shanghai Fragrance and Flavor Factory, have been relocated, while the land will be reclaimed for “ecological remediation,” said Cao Liqiang, Party secretary of Putuo. The future Taopu innovation town, covering 4.2 square kilometers in the core area, aims to gather a swath of companies on science, education and entrepreneurship to facilitate the city government’s ambition to become a “scientific and innovation center with global influence,” Cao said. The district plans to take over some 2.5 square kilometers of former industrial land from the companies by the end of the year and launch remediation on the ecological system, soil and underground water, Cao said. Taopu was among the first batch of chemical industrial parks in Shanghai. Set up in 1954, its development of industrial enterprises was at its peak in the 1980s when Hero pens and locally produced perfumes became popular merchandise in Shanghai. However, rapid industrial development not only brought about economic growth but environmental pollution as well. To restore the park’s environment, the district is planning to create a large greenery park within the scientific zone covering a square kilometer. It is expected to become the largest downtown green land area, Cao said. 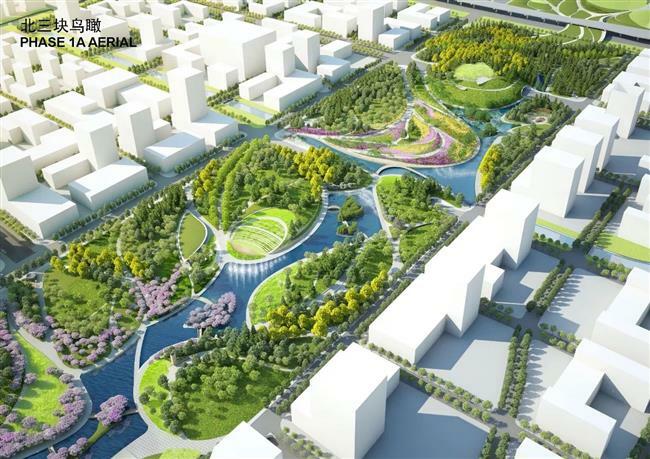 The design of the Taopu green area is inspired by Hyde Park in London and Central Park in New York, according to the district government. It will also incorporate traditional Chinese cultural ideas such as painting, calligraphy, dance and tai chi. The Putuo government also plans to wipe out old-style markets that were also once popular among locals, and replace them with parks and sports facilities. Standing as the northwest gateway to downtown, Putuo once had 106 wholesale markets, including the city’s largest seafood market — Tongchuan Road Aquatic Product Market. These markets have contributed to both economic development and residents’ lives , but they later suffered from rampant illegal building, according to the Putuo government. The number of the markets fell to 27 by the end of 2016 and will drop to 13 by the end of this year, Cao said. “Some of the land will be converted into industrial parks, while other land will be used as public green land, and for cultural and sports facilities, as well as affordable housing,” Cao said. Tongchuan Road fish market was shut down last November to be replaced by the Zhenru Greenbelt, which will cover 215,000 square meters in the historic Zhenru Town, according to the district government. Furthermore, to improve the traffic, the district has been redeveloping a congested road into an urban expressway with a new tunnel in a bid to resolve traffic problems in west Shanghai. A 2.9-kilometer tunnel will be built beneath Wuning Road in Putuo between the city’s Middle Ring Road and Dongxin Road near Suzhou Creek. It will have two lanes in each direction with a speed limit of 60 kilometers per hour. The road has been suffering severe congestion because of the large number of vehicles entering the city from Shanghai-Nanjing (Huning) Highway, according to the city’s transport committee. Two new bridges, Anyuan Road and Yunling Road W. bridges, will be built over Suzhou Creek by 2020 with a further seven bridges across the creek in the planning stages.